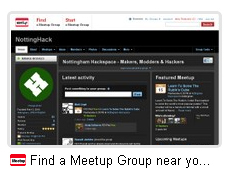 We are no longer running the Nottinghack site at meetup.com. We’ll be experimenting with a new events diary over the next couple of weeks. You can keep up with events and news about the Nottingham Hackspace by following us on our twitter @HSNOTTS or on Facebook Nottinghack Page or by checking here regularly. Wednesday Open Hack Night – it’s FREE & always will be!